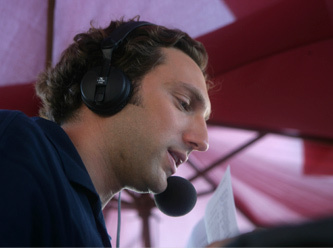 Israel’s first professional baseball league debuted on June 24, 2007, and I served as the league’s official play-by-play announcer that summer. Each Sunday I called the “Game of the Week” from the Yarkon Sports Complex at the Baptist Village in Petah Tikva. The games were rebroadcast in the U.S. the following night via Comcast West channels across the United States. The games were available in 2.4 million homes, including those subscribing to Dish and Direct TV. In April 2012, I began broadcasting Major League Baseball for an Israeli audience in Hebrew. I called a weekly game for Israel’s Channel 5 sports channel, the local equivalent of ESPN.